Whether you are a thrill seeker or fitness enthusiast, there is no refuting that a mountain bike sits among your ‘top-10-must-have-machine’ list. The versatility, portability, and durability of these bikes make them a worthy investment especially if you have a soft spot for the cross-country adventure. With your feet on the pedals, there’s nowhere the best mountain bikes can’t take you and consider that it is now possible to get your hands on a decent bike for less than $600, makes the prospect of owning one even more attractive. But aside from this, are there any unique benefits that these machines offer? Mountain bikes offer a simple, fun way of building your leg’s muscle strength. In addition to this, getting into a habit of going out for cross-country biking every-once-in-a-while is a sure easy way to tone your glute, calf and quad muscles and get in shape. 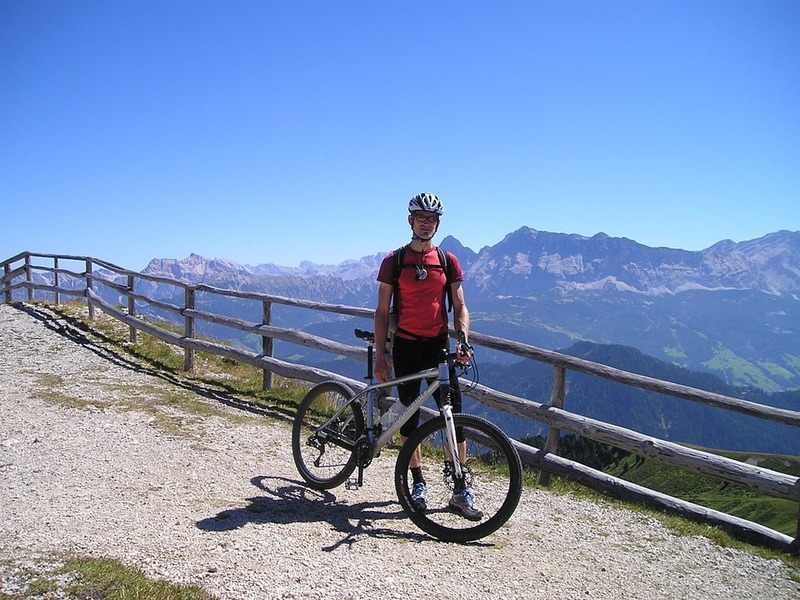 Mountain biking is one of the best ways of carving your cardiovascular strength and resilience. And at the same time, you will be optimizing your fat-burning rate. It’s a cheap and healthy means of transport. You obviously don’t have to refuel your bike, unlike a vehicle. Biking is one of the recommended environmentally friend modes of transport over both short and long distances. That being said, you might want some of the best mountain bikes under 600 dollars that you can purchase online today at the click of a button. We have done the legwork for you, and come up with the top cream for you to make your selection. If you are out for a decent bike that is not necessarily top, then this Sorrento hardtail is a worthy consideration. It has fairly durable parts, looks and feels solid and the 19-inch alloy spoke wheels are definitely quite a looker. What’s more, thanks to the front end shock absorption construction, you won’t have to worry about ending up with aching elbows after a day spent navigating a rough terrain. The handlebars are also excellently built and can prove to be relatively comfortable particularly if you are a rider who assumes a neutral position. That said, this bike’s gears are some of the smooth shifting ones and the leather sandal helps take some of the edges of a bumpy terrain. The only downside here is that the manufacturer prefers to ship this bike in parts such that the buyer has to assemble it up himself upon arrival. The Schwinn Protocol is arguably one of the best well-built yet affordable mountain bikes on the market at the moment. The bike makes use of a Schwinn Aluminum Dual Shock Suspension frame which is reinforced with a steel rear. This implies two things; For starters, it is entirely lightweight and shouldn’t be a problem throwing it at the back of your truck when you need to. Secondly, the suspension frame is designed to absorb and smother out all the rough ruts and bumps of a rough terrain that you can avoid during a cross-country trail. The same way your elbow, shoulders, and arms don’t have to bear the full brunt of the shock generated by thump ups during use. The front fork evens out and absorbs these tremors up-front instead. And for the aesthetics, the manufacturer found it worthy to include high profile alloy rims matched with black bladed spokes. In other words, if you are looking for something that can handle an occasional downhill drift thanks to the sturdy Promax disc brakes confidently. 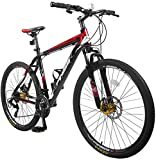 Nashbar AT1 29er Mountain Bike is one of the best 29″ mountain bikes that you can get today without breaking the bank. The frame is steel MTB and has been industrially tested and proven to be incredibly durable while remaining lightweight. No products for "B00BU5X0FQ" found. Couple that with an excellent trail feedback and a Shimano 7-speed drive gear train and you have yourself a beast to face a hilly terrain confidently. It is also one of the few bikes that allow some degree of customization should you need to buy some aftermarket parts to come up with a project bike. In addition to this, the 75mm of dual shock absorption in the front fork comes in pretty handy when the powerful disc brakes are employed. 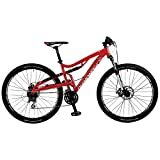 Diamondback Bicycle Overdrive Hard Tail Mountain Bike Being a 27″ wheel version, the Overdrive is one of the crops of bikes that are designed for the entry-level mountain biker. In fact, the manufacturers go a step ahead and include a special Allen key set just make sure that setting up this beauty is comparatively easy. On to the technical aspects, the pedals are designed to have enough grip for cross-country mountain biking. The brakes can be customized easily for your desired grip and being an entry level bike, it doesn’t come with extras such as a kickstand, bottle holder, and the lights. You will have to buy these separately later. Diamondback Recoil 29er Mountain Bike is one of the most common full-suspension mountain bikes on the cross-country trails today, this Diamondback is one of the least complicated lightweight bikes on the scene right now. The frame is constructed using a special aluminum alloy the trusted 6061-T6 for superior strength and durability. Otherwise, the suspension fork at the front employs SR Suntour XCT shock absorbing technology to take the rough edge off ruts and bumps while still delivering a sturdy firm ride. Speaking of which, this is the perfect bike for your off-roading trips if you don’t mind part, thanks to the 24-speed gears that make obliterating steep inclines look like child’s play. That aside, with this bike, you can cruise downhill confidently knowing that the Tektro Aires Mechanical disc brakes can kick in as soon as you need them. Merax Finniss 26″ is basically everything a mountain biker would want. It comes in a simple 33-pound light-weight frame, 26-inch rims, and an 80mm travel suspension fork a combination that defines first-rate in the cheap mountain biking space. It has been adjusted for every type of rider, with the taller guys seeming to have been well catered for in this Finniss generation. The seat can be adjusted to accommodate riders between 5’5″ and 6’2″. Perhaps what makes it a go-to option in a range of alternatives of its class is the dual-disc brake system which offers a better and reliable brake performance. Hardtail or Full Suspension – Which One is Better? A hardtail is typically a bike with a full solid frame and one that has a suspension fork at the front. The construction design used with a hardtail bike is quite simple compared to that of a suspension bike. On the other hand, a suspension bike has almost the same suspension front on the front, but the frame comprises of two separate pieces, a rear triangle and a front triangle that are joined together using pivots. As a consequence, the two sections can move independently, and an external shock absorber controls the degree of this movement. When it comes down to deciding the better bike, you will have to consider a couple of factors. This includes but not limited to your riding style, average terrain that you intend to use the bike on and personal preferences. That said, Hardtails are generally cheaper than full suspension bikes and are easier to maintain. On the other hand, a full suspension bike offers a smoother ride even in the roughest of the terrains and feels more comfortable and ‘in place’ than a hardtail. This will influence whether you will go for a hardtail, full suspension or rigid bike. As usual, the better and more complete the suspension, the more expensive the bike will be If you usually spend most of your riding schedule on local trails, then you already know that buying a downhill bike might not be the best idea, particularly on a budget. That one will be most likely be a best full suspension mountain bike and you will have to shell out some decent dough for it at the same time, if you live in an area that snows for most parts of the year, you might want to go for a bike with broader wheels for that increased traction. While there are bikes that cost up to over $10,000, you can still find a decent bike with less than a paltry $600. However, it is advisable that if you are on a tight budget, prioritize either a rigid or hardtail bike. Any full suspension bike you will land in such a price range is likely to be poorly built. Still on the budget, if you have no qualms spending $1000+ on a bike, then a titanium-framed bike would be lighter and better than a simple aluminum-framed one. If you are a fast rider who enjoys rolling over obstacles with full speed, then you will want to go for a bike with hydraulic brake rims. Similarly, such a riding style would mean that your ideal bike should be one with a smooth gear train and at least 29″ wheels. On the other hand, however, if you only need a mountain bike for cruising back-and-forth on paved trails, a simple rigid bike with rim brakes should suffice. Whether you consider yourself a beginner or a veteran in the world of mountain biking, here are some of the things you shouldn’t let slip your mind. These do not fashion statement articles but meant for your eye’s protection against debris, dust, branches and the sun. It easy to trip the brake levers accidentally if you get into a habit of having your fingers on them. As much as speeding down a deserted highway can be a scary affair, the adrenaline rush that follows afterward is definitely worth it. Just before a Hill Don’t wait until you begin the incline for you start shifting the gears. You will break your chain. The last thing you want is one pedal getting trapped by a branch/boulder when you are in a full speed descent. The fall that will follow such a nasty mishap is one that you won’t likely forget in a long time. If you are not pedaling as you will notice, this allows your legs to absorb some of the shock generated by going over obstacles. Be prepared, you never know where and when next you will encounter a puncture while in the middle of the woods. Also when going for cross-country, you might want to carry some spare food, water, and an emergency kit just in case you get stranded on your trail. This applies when going for a cross-country with a group of friends. If you are a beginner, watch how they go round obstacles and try to replicate this especially if your trail is rough/uneven. You don’t break Strava’s world record on your first trail, and neither should a snail overtake you. This includes the helmet, gloves, lights knee and elbow pads and the pedal hooks. The less familiar the terrain ahead is, the better prepared you should be. The world of mountain biking is as vast as the difference of riders in it. At the end of the day, it all comes down to selecting a bike, riding style and trail that suits your lifestyle. And all these should fall within your budget but without compromising on your comfort and safety. That being said, always be open-minded and ready to upgrade your bike every now and then particularly if you are a frequent rider.